Submitted photo McKinley Elementary School fourth grade student Jillian Dameron successfully lobbied to have a buddy bench installed at the school. Her hope is that kids who need someone to play with during recess will sit at the bench and others will come over and engage with them. XENIA — Jillian Dameron usually has an easy time finding friends at recess. But not all kids do and the McKinley Elementary School fourth grader decided to try and change that. The 10-year-old successfully lobbied Principal Garry Hawes to install a buddy bench at McKinley in order to help find students a group to play with at recess. The idea came from Dameron’s time as a student at Clinton-Massie Elementary School, which has a buddy bench. Toward the end of last school year Jillian sent a letter to Hawes. It was a “well-written” letter, according to Hawes. Hawes queried the PTO, which jumped on board with the idea and paid for the bench. Jillian got the good news about 10 days later when her father, David, handed her the mail which contained Hawes’ reply. “I was like pretty excited,” she said. Hawes said he “whole-heartedly” agreed with Jillian’s assessment that a buddy bench would be beneficial. Hawes said some students will be trained as ambassadors, to invite students to play with them and asked Jillian to be one. Carlisa, a children’s pastor at Liberty Worship Center, wasn’t the least bit shocked that her daughter was the driving force behind the bench — which will be dedicated to the memory of a classmate who died from cancer. Carlisa posted a photo of Jillian and the bench on Facebook earlier this week and within hours it had 65 shares and more than 200 likes. There’s even chatter about getting benches like that at other schools. That made the Dameron family happy. “Oh my gosh, over the moon proud,” Carlisa said. Strategically placed inside the McKinley playground area, Dameron and Hawes hope it will cure the recess blues. “The goal is to create a more inclusive climate for students,” Hawes said. 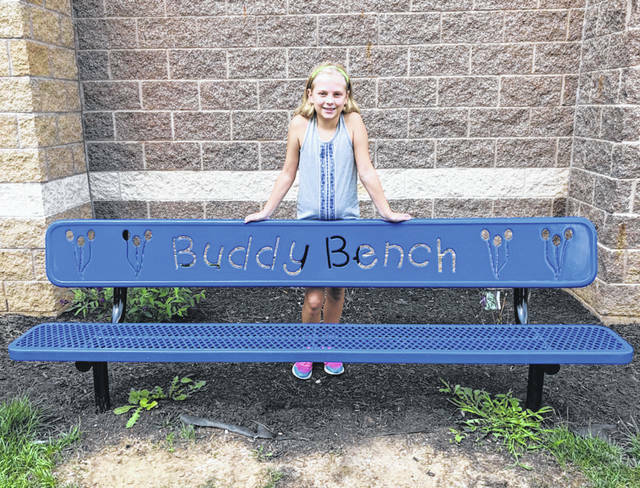 https://www.xeniagazette.com/wp-content/uploads/sites/32/2018/08/web1_Jillian.jpgSubmitted photo McKinley Elementary School fourth grade student Jillian Dameron successfully lobbied to have a buddy bench installed at the school. Her hope is that kids who need someone to play with during recess will sit at the bench and others will come over and engage with them.